It is a good time to be a designer right now. Great designers are in high demand. End users’ tastes are more sophisticated and companies value their product design more than ever. We’re currently hiring a designer at Stack Exchange. Ever since we put up the job listing, I’ve received countless applications. After combing through all the resumes and cover letters, I thought I’d share some tips with those who are looking for a design job. My view of an ideal job is that it should be more than just a gig that writes you a pay check. It should be something you’re passionate about, a place where you respect your coworkers and are proud of the projects you’re working on. This way, the job no longer feels like a “job” but a fun hobby that you get well compensated for. If you’re an employed designer and are looking for a new full time job, chances are there’s something amiss about your current job: maybe it’s not challenging enough, maybe you’re tired of freelancing and want a more stable set up, maybe your long commute is eating up too much family time, etc. Whatever the reason, I advise you not to apply at just any place that has a job opening, but rather, to find that ONE company you truly want to work for. Choosing the right company to work for is a personal decision, similar to choosing a mate. Does the company culture mesh well with your personality? Do the products they work on excite you? Once you find that one company you absolutely want to work for, then you need to make sure that your application gets noticed. That company may be getting hundreds of applications from designers equally qualified as you. I’d like to share some personal experience on my application with Stack Exchange, and how I got the job as its first designer. In 2007 I moved my family from North Carolina to the DC area for my new job with the Federal Communications Commission. FCC was pushing for a more modernized and user-friendly website and web app. I got to work on several interesting high profile government projects that I believed benefitted the general public. It was a comfortable government contract job and I liked my coworkers. The downside of the job was my long commute: 1.5 hour each way by train. As actual work went, there was a lot of maintenance time between each project launch. I felt like I needed more of a challenge creatively and it was time to move on. Around this time a former coworker and friend from a previous job, Jeff Atwood had recently started his new project, Stack Overflow which eventually led to the Stack Exchange network of Q&A sites. When I decided to leave FCC to find a new adventure, Stack Exchange was my number one choice. 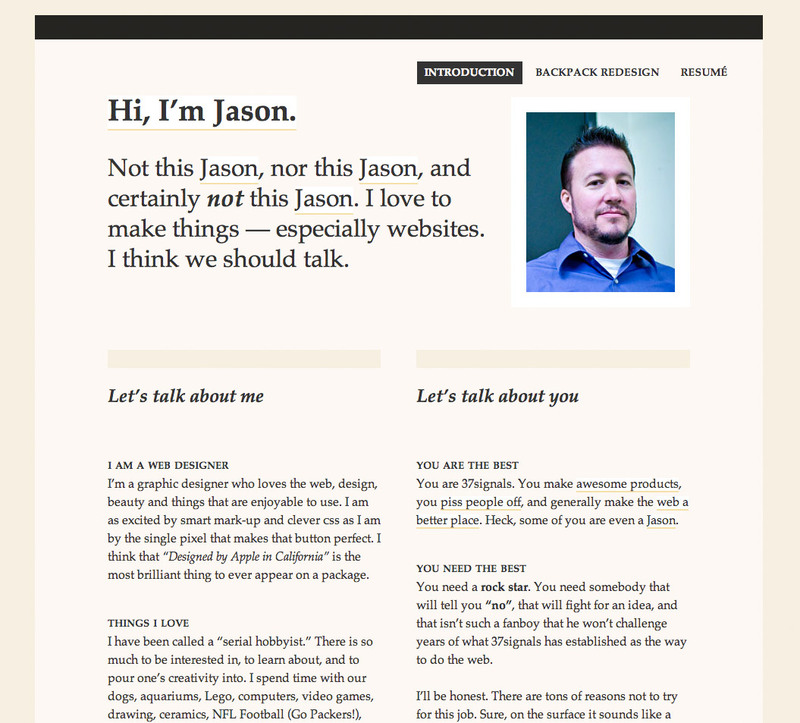 I had already worked with Jeff and his developers on smaller freelance projects. I loved how the team worked: they shipped things fast then refined- rinse and repeat. Also, Jeff had a talent to push me to do more than I thought I was capable of. Jeff told me he liked my work, but his business partner and CEO Joel Spolsky had to approve. “Hire my friend please” isn’t how the company recruited. This made me very nervous. I didn’t have any personal interaction with Joel, I only knew of him from his famous blog Joel on Software. I knew he was an extremely smart programmer and business person who had a great experience hiring people. Reading his blog posts on his hiring practices intimidated me even more. But I believed my skills would be an asset to the company, and culturally we’d be a great fit. I decided to formally apply at Stack Exchange. I had a cover letter and resume ready to email to Joel. Then I asked myself, why would he read my stuff out of all the other applications he was getting? What would make me stand out from the rest of the candidates? How could I get him to know me as a person instead of letters on a PDF? How would he know that I really, really wanted this job and wasn’t just sending my resume to a million different companies? I decided the best way to convey all this was not to send a resume, but to build a custom webpage. After all, I’m applying for a web design position, what better way to do it than to actually make a web site specifically for the company I wanted to work for? Make it personal. Since Joel and I have never had face time, I wanted to use a candid photo of myself, addressing him directly. Layout my skills and experience sections in a grid view that’s best suited for web reading, given the information density. Have a clear message why Joel should hire me, and repeat that message. The page only took a few hours to design and code. Below is a screenshot of it. (✂ truncated). It worked. After I emailed the Joel URL to the application page, I was quickly scheduled for a Skype interview with him. That interview with Joel turned out to be a lot less intimidating than I expected! In fact, it was the opposite. He was very friendly and funny. It felt more like a chit-chatting design session than a formal interview. He asked me a lot of great design questions and shared his view on the importance of good UI. My initial impression of Joel only re-enforced my desire to work for the company. I was hired on full time a few days later. It turned out some other designers had similar success with custom job application sites too. Jason Zimdars created this effective page when applying at 37signals. It led him to some freelance projects with the company, and eventually he was hired. 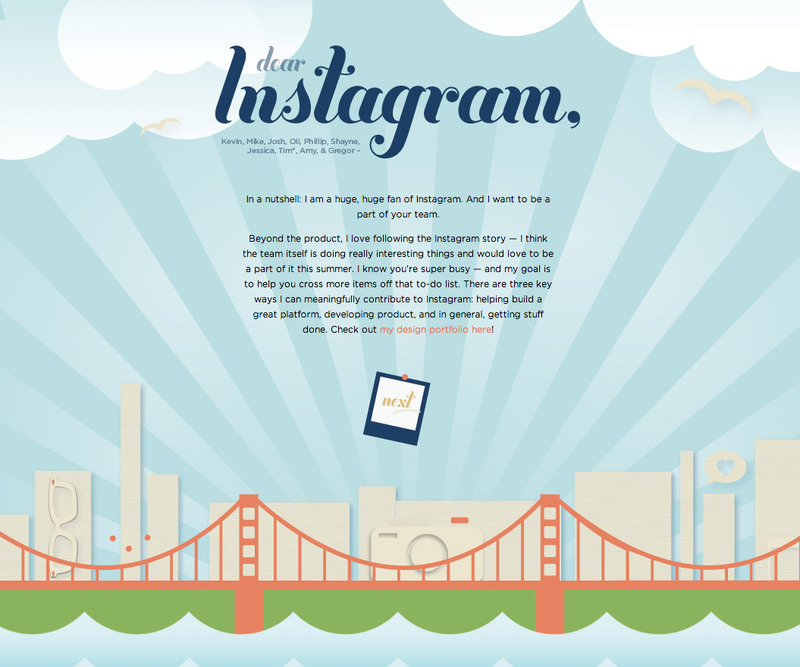 Designer Alice Lee is a huge fan of Instagram; she created “Dear Instagram” for her application. Even though the site didn’t get her the job she wanted, it got a lot of publicity. She landed an internship at Path because of it. Do these tailor-made job application pages guarantee you a job? Of course not, you will be judged by your actual portfolio and other skill sets. But you will make a good first impression. A company, especially a small start-up is not this faceless entity. There are real people behind it. These are the people you can affect on an emotional level with your sincerity. In other words, make them feel special. A generic cover letter that starts with “To Whom It May Concern” does not make anyone feel special. i understand. you want to hire the person, the human, not just a robot. but this is not a cultural fit for me. don’t get me wrong. i don’t want to work with jerks, i just don’t want to work with gushy huggy people with hearts flowing out of their mouths. calling yourself a rock star? come on! whatever happened to being cool? can’t we be cool and great at the same time, without gushing how great we think we are? so how does one find out about the culture inside a company, if you’ve never worked there, and you don’t know anyone there yet? who has time to snoop around to sniff the culture if you’re a talented designer already working (albeit not at a government job where they apparently pay you to enjoy plenty of down time). between what the company may say on their website, versus the real work environment inside, i haven’t been able to find many true matches. and this only shows your finished work. it doesn’t describe HOW you got to that stage. how you listened, gathered requirements, did interviews, presented mockups, how you handled criticism, how you argued for your viewpoints, how you balanced your opinion with the final decision of the client, and why. how did it turn out? etc. i agree this is better than just a pdf of work history, but it also leaves so much more to be desired, and not in an “I can’t wait to meet you to find out more” kind of way. @startupjerkfest The gist of this post is simply that, if you make a company feel that you’ve done some homework about them, and express that you really want to work there(not just any place), then your odd of standing out is higher. This isn’t about being “cool” or “cheesy.” It’s about being sincere and candid. YMMV. A custom made job app page isn’t the only way either. I’m sure there are other creative ways. Even a standard cover letter stating your similarity with the company’s culture/product is better than a generic one. This I agree. But I feel this is better for blog entries. I’m a fan of designers who document their design case studies. But sometimes this is a bit wordy to put on a portfolio or resume. Also these are the type of questions will be asked in an interview, once you get your toes in the door. why would any company hire someone who admits they like bacon? While recognizing that the hard work you put in paid off, I’m left feeling alternately inspired and unsure of how to apply this in any practical way to my own life. What if you really want to work for this one company and they still don’t hire you? If you only ever put in the effort to apply to that one company, then you are kind of in a bind. Isn’t it better to apply far and wide? And if so, then you can’t possibly put this much effort into each application (not to mention the disingenuousness of it). Jin, great thoughts and suggestions. When I went through the interview process at CURE a few years back, it was my first actual full-time gig in the design/web industry. Without being asked, I did a conceptual redesign of their homepage and offered it up in the second round of the interview process. The VP of the Dept was impressed, and a bit taken aback. She might have even been slightly offended, but she was more impressed because she hired me. I respect @startupjerkfest’s comments above about “just being cool,” but I disagree. In today’s marketplace for designers you have to not only stand out, but prove that you want to be someplace and that you SHOULD be there. Great post and perspectives, BTW!